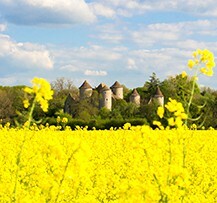 Enjoy nature and glimpse the future in Poitou, a region of contrasts. From your campsite in Poitou you can explore the countryside inland from the Atlantic Ocean coast, a freshwater paradise and a whole host of surprises. 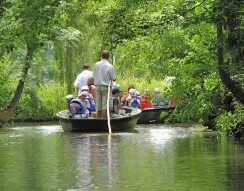 First comes the Marais Poitevin, a ‘Green Venice’ for you to explore by boat or bicycle, watched over by the towering fortress of Niort castle. 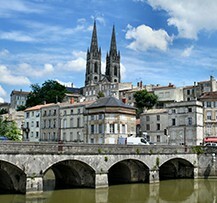 Then Poitiers: wander its city streets, discover its Roman heritage sites and visit the Futuroscope theme park. The future sits side by side with the traditional tastes of the past: creamy Poitou-Charente butter, the Marennes oysters of Oléron, Chabichou goats’ cheese and, of course, Cognac and its near neighbour Pineau des Charentes. Set in the heart of the Marais Poitevin, this Poitou campsite is a great place to get back to nature amid the wide open spaces of France’s “Green Venice”. 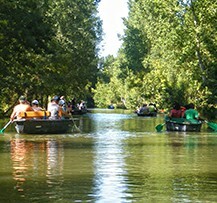 Our campsite near Coulon in Poitou is a great place to get back to nature and a great base for exploring both the Marais Poitevin marshes and the splendid nature reserve that surrounds Aiguillon Bay. By walking its lovely lanes from village to village. 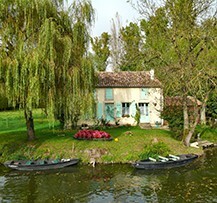 Not far from your campsite in the Poitou, you’ll find the Maison du Marais Poitevin visitor centre in Coulon. Your key to understanding the marshes, it offers 1½ hours of fascinating displays covering over 700m² and culminating in the Maraiscope, a 15-minute film recounting the history of this fascinating natural treasure. The museum’s guides will be delighted to assist you as you make your way through the exhibits. You’ll find hundreds of kilometres of cycle paths, waterways and signposted trails designed to help you explore architectural wealth of Niort and the curiosities of the wild Marais landscape. 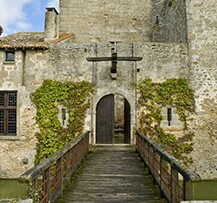 A camping holiday in the Poitou region also provides a great opportunity for visiting the Donjon de Niort. A staggering feat of architecture, this impressive medieval keep now houses regular exhibitions alongside its permanent local history and heritage visitor centre. Our campsites in the Poitou region offer the ideal base for visiting the city of Poitiers and its famous Futuroscope technology theme park which reinvents itself every year, offering new activities and attractions for young and old alike. Between walks why not stop off and taste some of the area’s culinary specialities ? The mouclade or “mussel pot” is a veritable gastronomic institution in the Charentes, made using mussels reared on the Charentes coast, and particularly in Aiguillon Bay, better known by their official designation as “moules de Bouchot”. You’ll find that most of the culinary specialities in the region involve shellfish and other seafood. Other culinary delights on offer the Poitou region include the traditional farci poitevin, a sort of herby pork pâté made with sorrel, leeks and spinach, and the broyé du Poitou, a sweet, pie-shaped patisserie generally served on special family occasions.